Rhein S.Q.M. can look back on many years of experience in the food industry and the food logistics sector, and can offer active support for the implementation of HACCP risk analyses, resulting optimisation efforts, auditing and periodic monitoring. We can also provide specific recommendations for HACCP software to match your business requirements in terms of sustainability and practicability. We may also be able to help you with integrating your very own HACCP concept into your existing management system (e.g. ISO 9001). 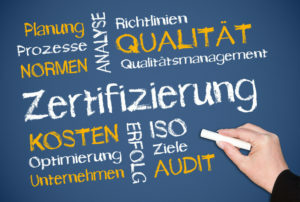 We guarantee the smooth and successful implementation of all your certification projects. Practice-oriented risk analyses moderated by experienced Rhein S.Q.M. will pinpoint any potential hazards for end-consumers, and will offer options to manage these risks in an emergency plan scenario. The fulfilment of these minimum requirements set out by clients and legislative bodies will qualify your enterprise for jobs in the sectors food production, packaging and food logistics. Rhein S.Q.M. can therefore support your company’s certification efforts in one single, comprehensive, manageable project. Contact us regarding this or any other topic!